There are many famous business schools in the world. Many have set up campuses in Singapore. University of Chicago Graduate Business School has an Asia Campus. 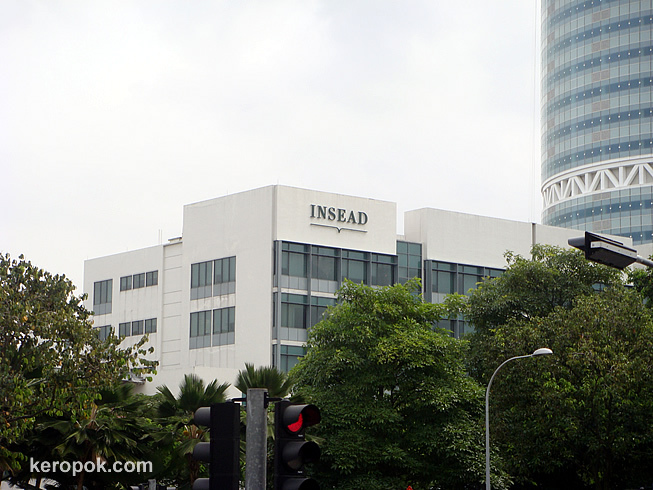 Insead also has an Asia Campus. I posted this photo because I just got reminded by yesterday's comments that someone who is associated with Insead is visiting! haha... Welcome to Singapore. Other very good business schools in Singapore are the NUS Business School and Nanyang Business School. The new kid on the block, Lee Kong Chian School of Business. If given a change to choose for an MBA from all of the above mentioned, which will be your choice? Well I'm honored! Just back yesterday morning and dragging around. I already miss the warm sunshine!